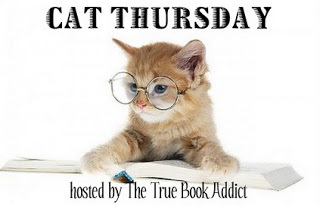 Musings of a Bookish Kitty: Cat Thursday: "I think I'll rest here for awhile." Cat Thursday: "I think I'll rest here for awhile." I find it hilarious when I see where these cats decide to plop themselves. We have one that chooses some very bizarre locations for her sleep, and she will sleep there for like an entire week. Then she changes her location. Very sweet kitty this Anya. Sandy - It's funny the places cats find to sleep. My cats are like yours--they tend to favor a spot for about a week or so and then switch to somewhere else. That is so funny! I guess she got tired on the way up or down! Kathy - Haha! Knowing Anya, I can believe it. LOL She's not the most active cat. The top is too high. The bottom is too low. The middle is jussssst right. Cats. I miss having one but the pup is like a cat and even meows so I still get my cat fix. Ti - My dog acts like a cat too sometimes (although no meowing). :-) Cats and dogs can be so funny sometimes. LOL, that is hilarious ;) Cats make me smile! :) Since I groom ours on the steps, they wait for me there! You might enjoy this bike-riding tabby. Jenclair - I can see why the stairs would be a great place to groom! I usually just groom mine wherever. Getting them to sit still for a grooming . . . Now that's the problem. LOL They love to be brushed but can't stand still. What is it with cats and choosing the middle of the stairs. Very cute, but I'm glad you were on the end that let you see her there! Charlie - I wish I knew. She is one that won't budge either when you want to go past her--and she's so big that it's hard to maneuver around her, especially if I'm carrying my daughter or a full laundry basket. So cute! Hope nobody steps on her, she has pretty good camouflage. Cats just own it all, everything. We live in their world, don't we? I love this. Adorable kitty just sleepin on the stairs :) I used to have a kitty that loved to sleep in the sink. He was always there, just taking a nap! Your kitty is very cute! How delightful - love how cats love stairs! Thanks for visiting me at Create With Joy! Would love to connect with you on Library Thing (just sent you a Friend Request). Joy - My other cat doesn't seem to care for the stairs much. Or at least I've never caught him napping there. But Anya sure loves to nap on them! Diane - Yes, it's the perfect camouflage for her! Sometimes I want to be a cat!! Love it! Anya is beautiful. My cats will lie on the steps too and I nearly fall over them every time. Yvonne - Thank you! Mine are always getting underfoot, especially when it's dark and I can't see. Road block! My kitties like to sprawl out on the stairs too. Mistress of the Dark - Exactly! Kate - Haha! That probably is exactly what she's thinking. Anya looks so content. That is what I call kitty bliss. Great picture! Kathleen - She is. :-) It's the perfect spot to avoid being Mouse'd. Your kitty blends in with the stairs in that picture! She is so DARN cute! I definitely miss having a cat but I think I will wait until the kids get a bit older before we get one. Samantha - Thanks! Young kids and cats equals a lot of tail pulling. Since the cats were there first, Mouse has learned (mostly) to be gentle with them, but she still has her moments. I think we would have waited to bring in a cat if we hadn't already had them until she was older--for their sakes! Michelle - Thank you! She does have a habit of getting under foot sometimes. :-) She's pretty fast though.